The last great tennis player from Nebraska rose to become No. 1 in the world and was also the last American male to win a grand slam title. This individual was Andy Roddick, but Jack Sock might have a rebuttal or two as he continues to create his own history. The 22-year-old American is coming off his best year on the ATP Tour thus far after capturing his first title at Houston in April, defeating Sam Querrey 7-6(9), 7-6(2). Just a month before, Sock found himself playing in his tour first level match since October 2014 after skipping the Australian Open due to injury. In Sock’s first tournament back, Indian Wells, he would have to save a match point during his second round match against 2012 BB&T finalist Gilles Muller before pulling off the three set win, 3-6, 6-3, 7-6(7). 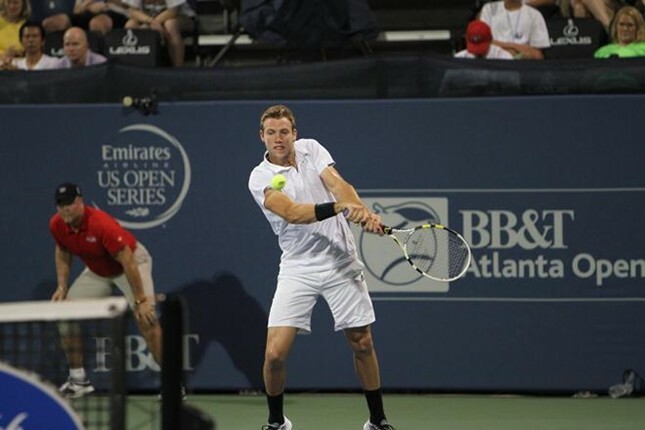 Sock went on to reach the fourth round of the ATP World Tour Masters 1000 event before falling to Roger Federer 3-6, 2-6. Entering the French Open, Sock was a heavy underdog against first round opponent No. 10 seed Grigor Dimitrov of Bulgaria. Carrying some of his momentum from Houston in to Paris, the No. 2 American effortlessly conquered the match 7-6(7), 6-2, 6-3. The win made Sock the first American to beat a Top 10 seed at Roland Garros since Jan Michael-Gambill in 2000. Using his punishing forehand, one of the most damaging weapons on tour, and only dropping one set to get through the second and third rounds, Sock faced nine-time French Open champion Rafael Nadal in his first round of 16 appearance at a Grand Slam. Sock did not stagger with the task at hand. Attempting to prevent Nadal from earning his 70th win in Paris, Sock would succumb to the Spaniard in four sets; 3-6, 1-6, 7-5, 2-6, bowing out the second Grand Slam event of the year, but not without gaining a new-career-high ranking of No. 31. Although “J. Sizzle” (as he is often nicknamed) is looking to continue the growth of his singles game, he is already a two-time Grand Slam champion in doubles, partnering with Canada's Vasek Pospisil to win the 2014 Wimbledon crown, topping the Bryan brothers in five thrilling sets, and the 2011 U.S. Open mixed doubles title with Melanie Oudin. The 2014 BB&T Atlanta Open singles semifinalist and defending doubles champion started playing tennis at the age of eight. Having a superb junior career prior to becoming pro, Sock compiled an 80-0 record in his high school career, winning four consecutive state championships along the way. He would win the 2010 USTA Boys' 18s Nationals (Kalamazoo) and boys' junior U.S. Open title later that year. With confidence growing, Sock looks to ease the minds of Slam-starved American fans on the road to the U.S. Open, who long for their next men's tennis star.